My roommate and I have a latke and menorah lighting date and I’m so so excited. 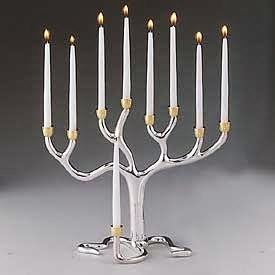 I have loved this menorah since I was maybe 10 and flipped through my mom’s Source for Everything Jewish catalog. Even though it’s not technically Kosher (all 8 candles are supposed to be the same height), I would love to add it to my collection.